Leo Diamond presents a 1/3ct princess cut diamond in a classic solitaire design loved by many for its timeless appeal and how it gracefully raises the diamond into prominence. The Leo Diamond is a product of four generations of expertise in the art of diamond cutting, resulting in the first diamond that was independently certified to be visibly brighter than other diamonds. The band is made from 18ct white gold, with an authentic Leo inscription that features a smaller diamond set inside. An extra certificate is included in your purchase to verify its superior light performance. 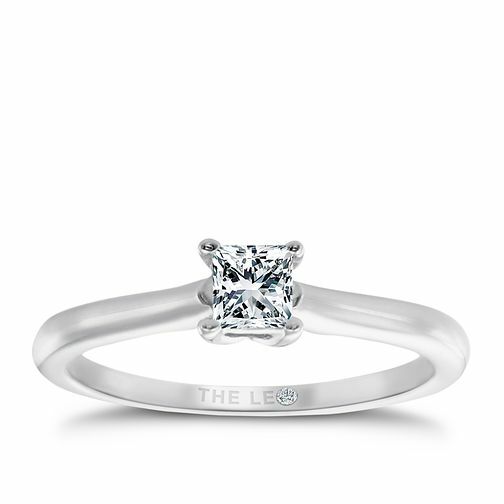 Leo Diamond platinum 1/3ct I-SI2 princess cut ring is rated 5.0 out of 5 by 5. Rated 5 out of 5 by Anonymous from Amazing Ring A beautiful ring that matches the beauty of its soon to be owner! We spotted this ring whilst out ring shopping and was drawn back to it many times - purchased in secret, now awaiting the right moment! Rated 5 out of 5 by Anonymous from Made To Perfection Very nice design from a very prestigous diamond quality and brand!